Serious air pollution plagues most major Chinese cities, where environmental protection has been long sacrificed for the sake of economic development. 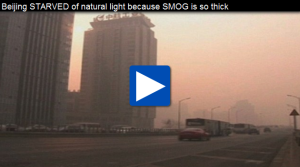 Coal burning and car emissions are major sources of pollution. 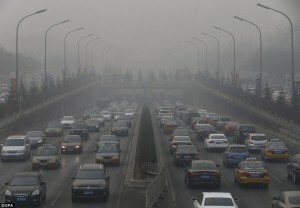 In recent years, China has beefed up regulations and pledged financial resources to fight pollution. In the far northeastern city of Harbin, some monitoring sites reported PM 2.5 rates of up to 1,000 micrograms in October, when the winter heating season kicked off. In December, dirty air gripped the coastal city of Shanghai and its neighboring provinces for days, with the density of PM 2.5 exceeding 600. Beijing authorities said the haze on Thursday had reduced the visibility to several hundred meters (yards) and that the severe pollution was likely to continue through Friday. Beijing’s mayor pledged on Thursday to cut coal use by 2.6 million tonnes and set aside 15 billion yuan ($2.4 billion) to improve air quality this year as part of the city’s ‘all-out effort’ to tackle air pollution, state news agency Xinhua said. 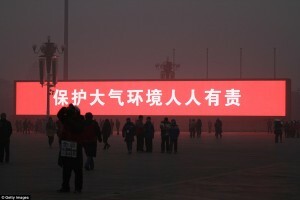 The announcement by Wang Anshun came as the capital was blanketed in its worst smog in months. 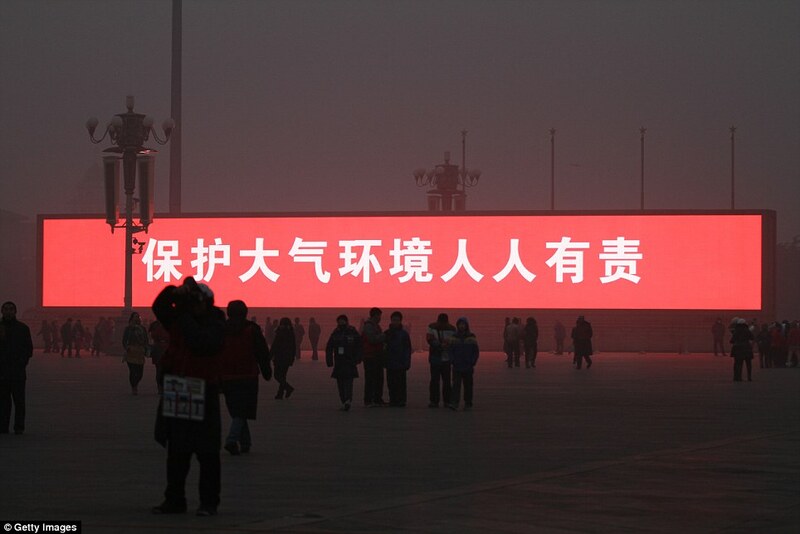 An index measuring PM2.5 particles, especially bad for health, reached 500 in much of the capital in the early hours. Coal-burning boilers inside Beijing’s fifth ring road – covering the built-up area of the city – will be eliminated and measures taken against coal burning in the capital’s periphery, Xinhua quoted Wang as saying. The city also aims to ban all heavily polluting vehicles this year, cut new car registrations and promote new energy vehicles, Wang said. 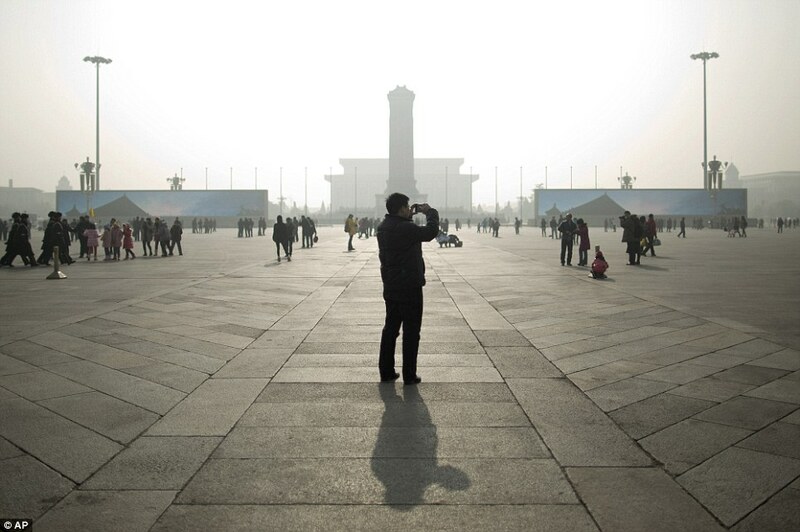 Beijing reported 58 days of serious pollution last year, or one every six to seven days on average, Xinhua quoted Zhang Dawei, director of the Beijing Municipal Environmental Monitoring Center, as saying. 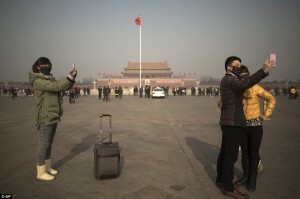 Separately, Xinhua said China had shut down 8,347 heavily polluting companies last year in northern Hebei province, which has the worst air in the country, as the government moves to tackle a problem that has been a source of discontent. 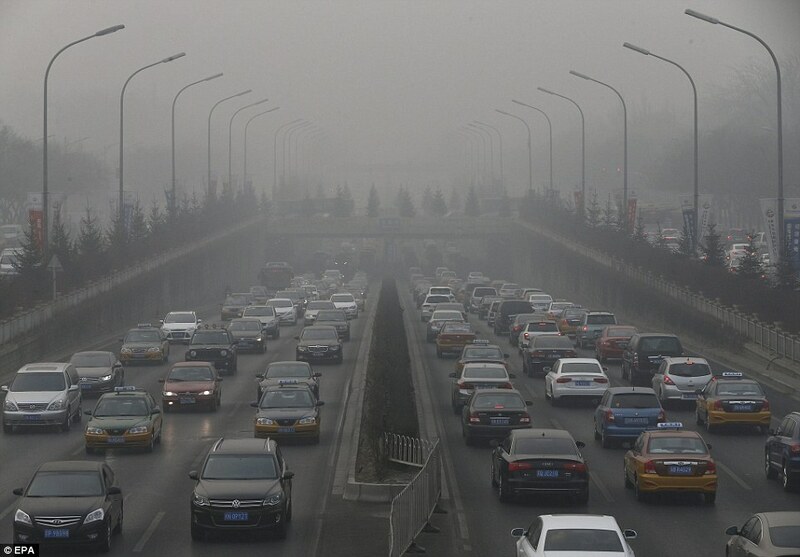 Local authorities will block new projects and punish officials in regions where pollution is severe due to lax enforcement, Xinhua cited Yang Zhiming, deputy director of the Hebei provincial bureau of environmental protection, as saying. High pollution levels have sparked widespread public anger and officials concerned about social unrest have responded by implementing tougher policies. 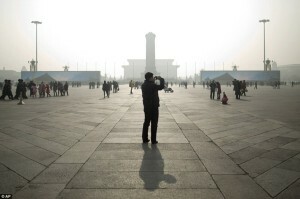 Hebei, the country’s biggest steel producer, is home to as many as seven of its 10 most polluted cities, Xinhua said, citing statistics published monthly by the Ministry of Environmental Protection. 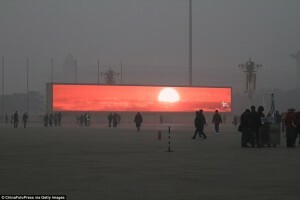 Pollution in Hebei often spreads to neighboring Beijing and Tianjin. Some small high-polluting plants are being relocated to remote areas to avoid oversight, Xinhua quoted Yang as saying. He said the government would ‘beef up the industrial crackdown’. China has drawn up dozens of laws and guidelines to improve the environment but has struggled to enforce them in the face of powerful enterprises. On Wednesday, China’s commercial capital, Shanghai, introduced emergency measures, allowing it to shut schools and order cars off the road in case of severe smog. Hebei plans to slash crude steel output by 15 million tonnes in 2014 and cut coal consumption by the same amount as part of anti-pollution measures.